Siloam Construction Services - What are Structural Insulated Panels? Structural insulated panels (SIPS) are one of the most advanced building systems in use within the construction industry today. The innovative and high performance panels provide a cost effective, environmentally friendly and labour saving alternative to traditional timber framing and masonry construction methods. Structuralinsulatedpanels (SIP) is determined to deliver this building solution to this competitive industry. Structuralinsulatedpanels (SIP) was originally established to offer sustainable, eco-friendly off-site manufactured, fast track building solutions with high thermal efficiency. Structuralinsulatedpanels (SIP) is confident the state of the art technology involved in the production of SIPs will produce improved performance and results in the construction sector. It caters to the entire construction industry including developers and builders, individuals building their own homes or renovating their homes, agents for developers, clients who require a small number of panels and clients who want a full architectural and development plan using SIPs. Recent changes in UK and European building regulations have resulted in developers and house builders using Structural Insulated Panels for new build projects to improve air leakage and provide vastly superior thermally insulated buildings. Structural Insulated Panels are usually used in roofs and external walls of buildings but may also be used in floors and internal walls. Their high axial load capacity and good bending strength, together with their excellent insulation and air tightness, produces sturdy warm structures. Structural Insulated Panels can be applied in a variety of projects including the construction of a room in an attic or roof, the building of extensions to existing houses, for tree houses, granny rooms, boats, school rooms and buildings, and club houses and community centres. In almost every aspect of construction SIPs can be applied in place of traditional methods. There are many advantages to Structural Insulated Panels including that it is very environmentally friendly. SIPs buildings are more energy efficient, stronger, quieter and draft free than older technology systems such as timber framing. This results in lower energy bills and cuts energy consumption and CO2 emissions. Its light unit weight and factory production reduces embodied and transport energy and onsite wastage. Therefore reducing the overall carbon footprint. 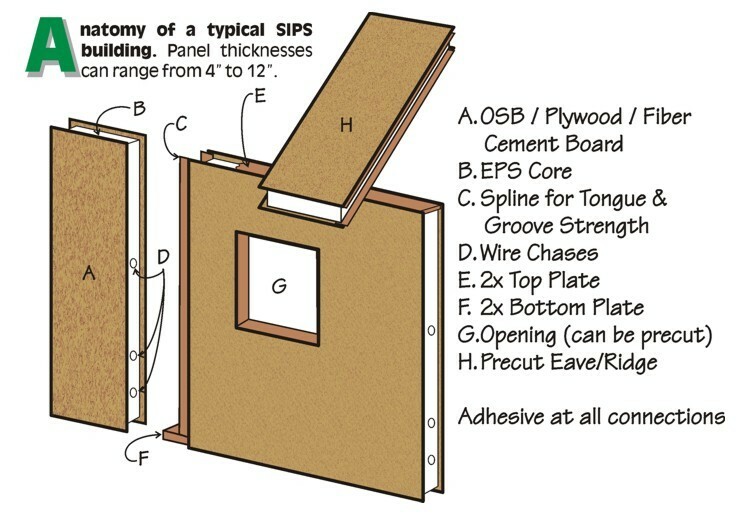 Manufactured in Structuralinsulatedpanels (SIP) factory, it is both time saving and cost effective. It reduces onsite labour, allows sub-contractors to begin work faster and will lead to lower energy and fuel bills. At the cutting edge of the construction industry, it is modern and is an investment in the future. New building regulations have meant more and more people are turning to SIPs to meet the new requirements and the codes for sustainable construction. Its space-maximising design flexibility offers the ideal building solution and can be tailored to our client’s preference to fit their requirements. Full design and technical support means no two projects are ever the same and each one is treated as a one off, and by paying particular attention to detail we are able to deliver what you want. SIPs provide excellent thermal performance as it prevents air-leakage at points usually associated with traditional methods of construction, it also exceeds the current Building Regulation requirements on its own. The light-weight structural strength of Structuralinsulatedpanels (SIP) panels allows large sections of building to be lifted in one piece for speed of erection but the panels may also be erected one at a time by hand where access is restricted. Structuralinsulatedpanels (SIP) buildings behave as thin shell structures, dispersing point loads throughout the entire surface area. The structural properties of the panels, makes it possible to create shapes and designs that would be too costly to produce in traditional methods. The expertise, knowledge and experience of Structuralinsulatedpanels (SIP) ensures that the exciting potential of Structural Insulated Panel Systems will become a major feature of the construction industry. Whatever design requirement you would like, Structuralinsulatedpanels (SIP) are confident they will deliver to meet your needs. Structural Insulated Panels – the future of building.